Summit of the 1,544 m high Wai’ale’ale volcano belongs to the rainiest places of the world – here fall some 10,800 mm of rain per year. More than 10 meters! 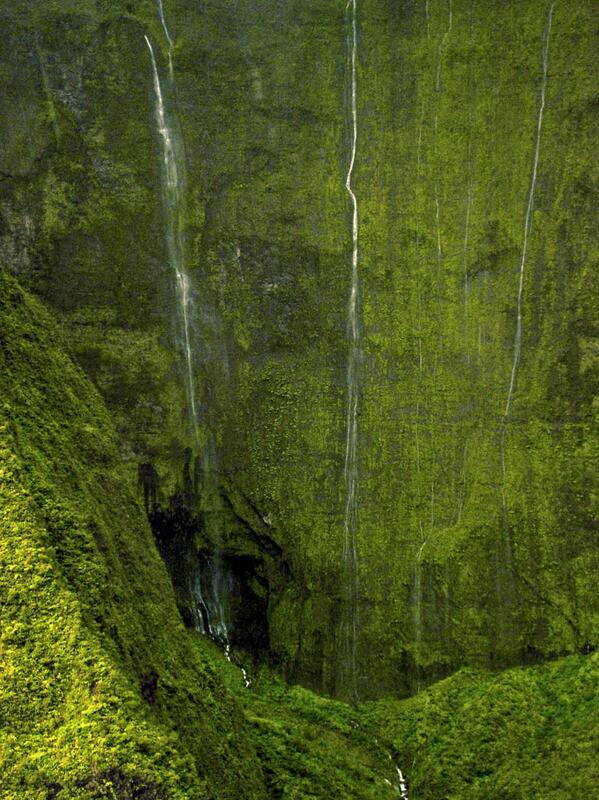 No wonder that the volcano is covered with bright green jungle and adorned with many waterfalls. Especially impressive is the dramatic box canyon to the east with the numerous beautiful Waialeale Falls. 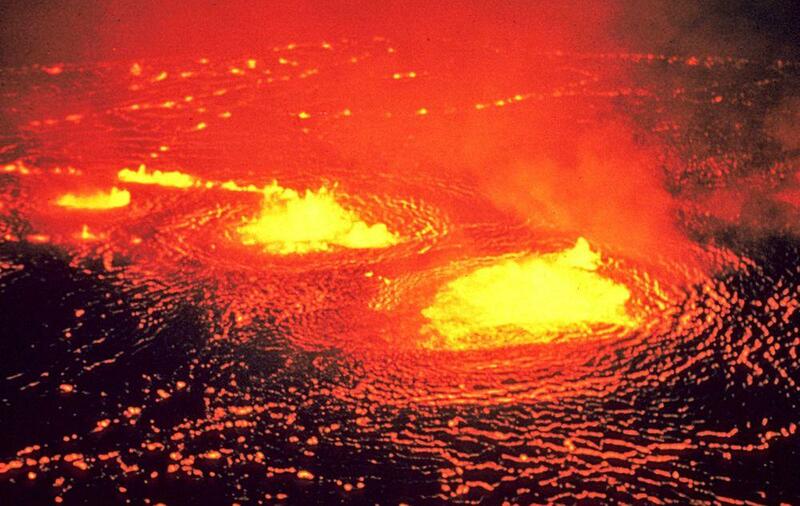 Wai’ale’ale ("ripling waters") volcano has been dormant for millions of years. Natural forces have reshaped the mountain – water has eaten away and ridged the hard rock. Constant rain and tropical climate have encased the rugged cliffs in emerald blanket of tropical jungle. The giant box canyon to the east from the summit often is called "Blue Hole" – it also has been washed out by the abundant rain. The height of the steep, nearly vertical walls of this unbelievable monument of nature exceeds 900 m.
Contrary to many written sources, "Blue Hole" is not a crater of volcano. Nearly all the time the summit of Wai’ale’ale is hidden in cloud – locals say that the summit is visible only some 20 days per year. 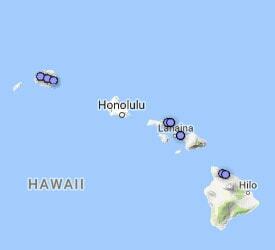 Kaua’i island is located in latitudes where the air blown from the ocean is full with mist. Summits of this island are not too low and not too high – thus masses of air are not diverted by the mountains. The air is blown up along the steep walls and the moisture remains on the cliffs. Especially efficient trap of the mist is "Blue Hole". True number and exact height of falls in "Blue Hole" is not known. The number of falls is changing according to weather – when there is rain, there are more falls and when less – less falls. 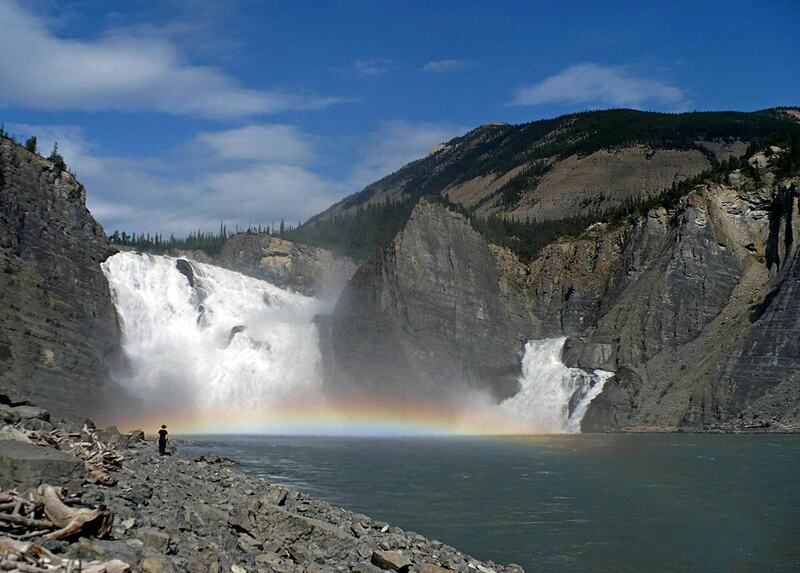 It is possible that nobody has tried to measure the height of each of these falls – although contemporary technologies like LIDAR could do the work perfectly. 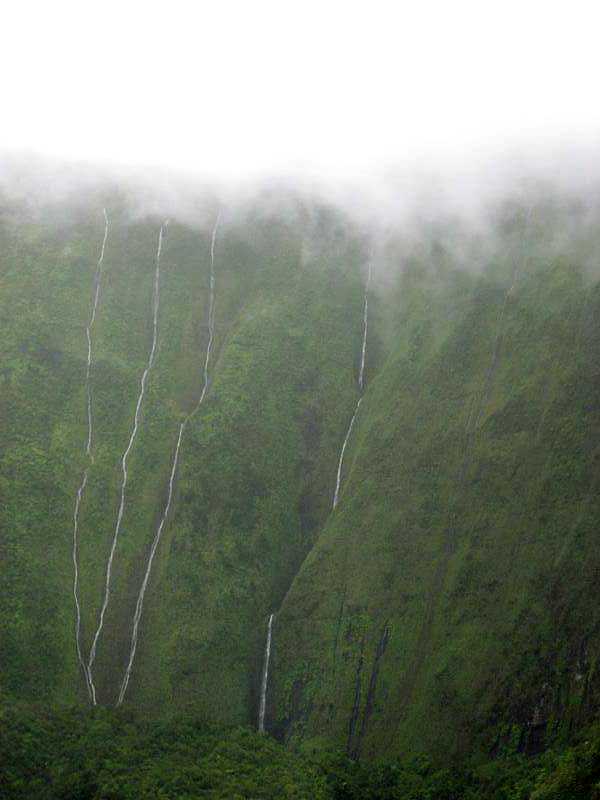 The height difference between the rim of canyon and the stream below is up to 910 – 920 m. Thus we can assume that Wai’ale’ale falls may reach heights up to 900 m. But note – water does not fall with a single plunge here – waterfalls flow down along very steep cliff with occasional plunges. Deep inside the canyon, further to the south there is large vertical cliff, too steep to sustain vegetation. 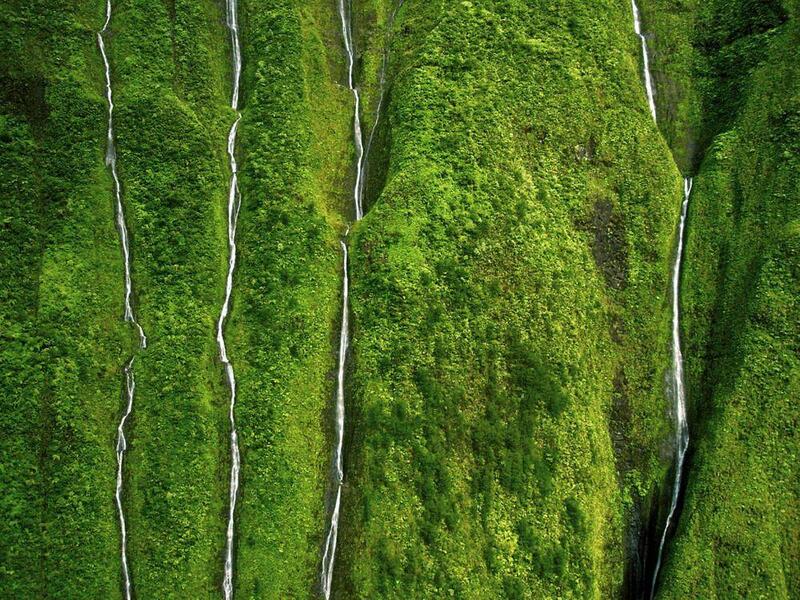 This is Weeping Wall, always covered with countless streams of smaller waterfalls. Most tourists enjoy the incredible sights of the "Blue Hole" through the window of helicopter – the sound of waterfalls in the canyon is beaten by drone of helicopters many times per day. Majority of helicopters though do not enter inside the canyon – winds here can be rough. Canyon could be reached after a strenuous walk as well. Walls of the canyon are extremely hard to climb and most likely nobody has done it yet. Height: up to 900 m?